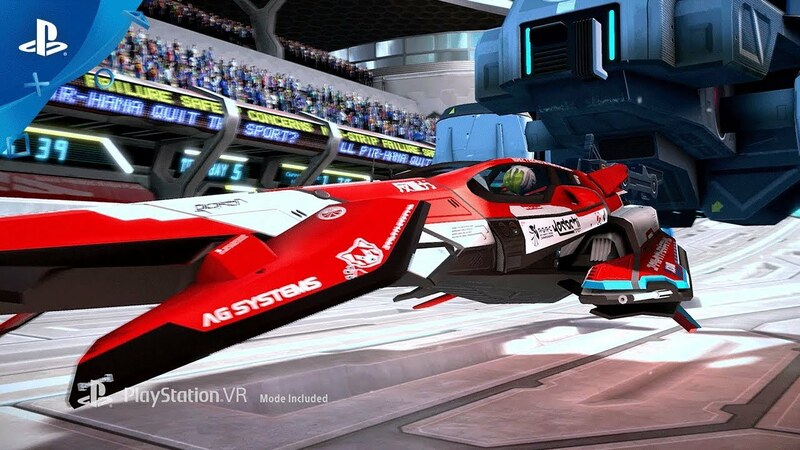 Race every track and mode in PS VR, plus new cockpit view with head-tracking, full 3D audio in upcoming update. Attention all anti-gravity pilots, it’s time to suit up once again! You have piloted your ships through the tracks of WipEout HD, Fury and 2048 in the Omega Collection in stunning native 4K* targeting a blistering 60FPS while listening to a whole new raft of thumping tunes. Now, prepare to see the world of WipEout in a whole new way as you blast round Omega Collection’s tracks in PS VR. Check out the first trailer below! And this isn’t a separate slice of gameplay: you can race in every track, across every game mode, off or online, with this free PS VR update. But not only that: we’ve created three new ships for PSVR pilots, featuring a special cockpit view for PS VR that includes head tracking, so you can check out the interiors of the new ships and see the futuristic racecourses like never before. And as you can now enjoy the game’s blistering soundscape in full 3D audio, this’ll be the most immersive WipEout experience ever. But that’s not all: we’ve also created new ships that are exclusive for you PS VR pilots, and we’re also happy to announce that this update will also include the new remix of “Shake It” from our recent competition winner Vieille Griffe. You’ve been asking for it, and now we are almost ready to give you it. WipEout Omega Collection will be playable on PSVR in early 2018. *PS4 Pro system and 4K display device required to view in 4K. Well snap… I been avoiding picking this up since I own them all on the vita and PS3 but vr could make this a must buy. Very cool. I’ll gladly pay $15 for a good VR experience, and since I haven’t gotten GT Sport, I guess I need SOMETHING. So I got this now. Daaaaaaang. This is a welcome surprise. Like wheremyconary mentioned above, I was satisfied with my current collection of Wipeout titles on their original platforms. But the addition of a VR mode to this game could push me over the edge to get it. Nice work Sony XDev! I just bought Wipeout too! The fact that I’ll be able to play it in VR makes the purchase even sweeter. I am SOOO ready to puke my guts out!! I love Wipeout, but I hope this doest earn “Best Stomach Wipeout” VR game of 2018.
make this a PS Plus title. I already own the PS3 version, and I wouldn’t mind having it on my PS4 – but not at full price. I don’t own the VR module – but hey, if you gave me a game I’m kind of interested in, and it increases my interest in PS VR – isn’t it a win-win for both? Seriously Sony, this is a great update, however, some of us are still waiting for the Stereoscopic 3D update that this game deserves that the PS3 version had. If you can implement VR 3D mode, then you can implement Stereoscopic 3D for those of us with beautiful Sony 3DTV sets, and not only that, but for the VR 3D mode can you please get the passthrough device to the TV output the same 3D that the VR is outputting so those with a 3D TV set can allow others in the room to view the VR content using the Stereo 3D glasses so they can also enjoy the experience as well? It should not be rocket science, and I know that it would be awesome, then I can play Resident Evil 7 in VR and others in the room can watch it on my 3D TV set in Stereo 3D for a more immersive experience, plus if I’m watching a 3D movie on the VR headset, then others in the room can also watch the same movie on my 3D TV in Stereoscopic 3D also with me instead of watching it flat as paper. THAT would be an amazing update to the PS4 system! How do I get this update? When does it come out?